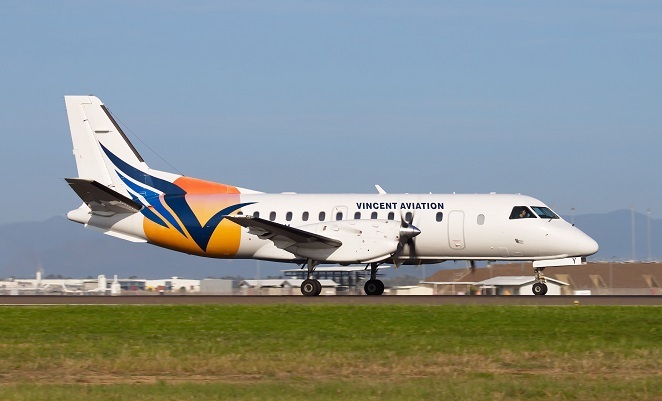 The Australian arm of New Zealand-based regional airline Vincent Aviation has entered receivership, with all flights cancelled with immediate effect and the futures of the airline’s 80 staff thrown into question. “On Wednesday 28 May 2014, Andrew Fielding and Gerald Collins of BDO Business Recovery & Insolvency (Qld) Pty Ltd were appointed receivers and managers of Vincent Aviation (Australia),” a statement on the Vincent Aviation website reads. “The receivers and managers ceased trading while an urgent assessment of the business and its operations is undertaken. Vincent’s Australian operations are based in Darwin. The company’s website says it employs 80 staff in Australia operating a fleet of four Saab 340 and five Beech 1900 turboprops and a single BAe 146 on a mix of RPT and charter services. Only as recently as February Vincent began operating Saab 340s between Sydney and Narrabri, after winning an interim licence from Transport NSW to operate the route following the collapse of previous operator Brindabella Airlines late last year. “We don’t believe this is a reflection on the Narrabri route, which had numbers increasing on a monthly basis and customers were extremely pleased with the service,” spokesperson for Narrabri Council, Diane Hood, told The Land newspaper. Vincent was also planning to begin flights between Sydney and Mudgee from June. “Vincent Aviation CEO Murray Collings told me this afternoon that his Board of Directors had decided not to proceed,” Mid-Western Council general manager Warwick Bennett said in a statement. “I understand that many residents will find the news frustrating. Meanwhile, flight tracking website Flightaware.com shows that Vincent Aviation’s New Zealand-registered BAe 146, ZK-ECO, which was operating in Australia predominantly on mine charter FIFO flights, flew from Brisbane to Wellington on Wednesday afternoon. And according to unconfirmed reports, the airline’s Saabs and Beech 1900s are being ferried to Townsville for storage. Vincent Aviation was founded by managing director Peter Vincent in 1990, and is headquartered in Wellington, New Zealand. The appointment of receivers to the Australian operation “does not include or affect the New Zealand operations of Vincent Aviation Limited”, the statement from BDO Business Recovery & Insolvency reads. The full statement, including information for passengers holding bookings with Vincent Aviation, can be read here. Vincent Aviation’s Australian route network. 4 perfectly good Saab 340B’s but I doubt REX will get them. The company always suffered from poor middle management, probably more so in the New Zealand flight ops department. Check and Training wasn’t much better (No doubt due to the Silly Wages they were paying). I just cannot believe this :'(. wages for Saab drivers just took a big hit, with so many now looking for jobs. wonder if a leaner meaner airline could come out of the “ashes” of Vincent Australia.